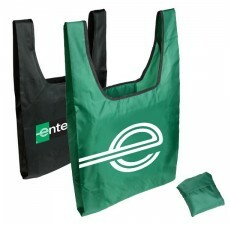 These unique Folding Cool Totes are the perfect product for your next tradeshow, event, or even to put in store. 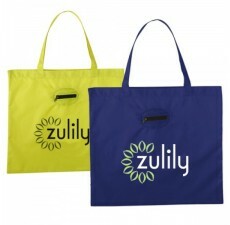 The thermal lining in these custom tote bags keeps hot items hot and cool items cool, making them ideal for beach days, grocery trips, and picnics. 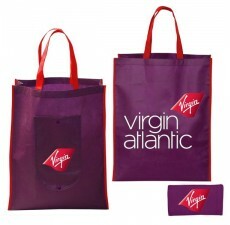 When not in use, fold these bags down inside a self-contained pocket and stash them away for convenient use. Folds down to 8.75"W x 4.5"H x 1"D. Eco-friendly material is sturdy, resistant to wear and tear, and easy to clean, giving your clients a product that will last for years to come. 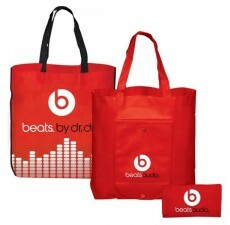 Increase your brand’s awareness and exposure with your selection of vibrant colors and your unique logo printed on the front--which will still be visible when the bag is folded! To get started on the customization process, contact us today.